In 2013, South Korean filmmaker Bong Joon-ho (Memories of Murder, The Host) was forced to settle for a VOD release of his enigmatic thriller Snowpiercer to avoid altering the film at the behest of Harvey Weinstein, who considered it ‘a smart movie for a smarter audience.’ Although it eventually became a moderate success, Bong sought alternative means of distribution for his latest project, and joined the ranks of (none other than) Adam Sandler in the growing list of original films produced by Netflix. 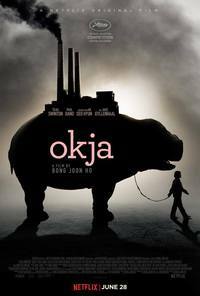 Okja, the tale of a young girl and her pet super-pig, became available to stream worldwide on June 28th - marking, in the end, a curious middle-ground that on the one hand enables unprecedented accessibility and on the other increases the likelihood of the film being watched on an iPhone to kill train journey time. All things considered, however, the final product is such a lovingly crafted plethora of bold ideas and eccentric comedy that we should be grateful to see it on any platform we can - just not a mobile phone, perhaps. It is 2007, and corporate CEO Lucy Mirando (played with cartoonish frivolity by Tilda Swinton, who evidently did not quite get her fill of madness from her previous collaboration with Bong) introduces a controversial plan to combat world hunger: breeding genetically enhanced super-piglets. Knowing full well that such ethically dubious biological intervention is far from digestible (excuse the pun) for the ordinary citizen, she ingeniously dresses it up as a family-friendly competition - a beauty pageant for pigs - to take place 10 years later. Meanwhile, in the beautiful South Korean countryside, a young girl called Mija (Ahn Seo-hyun) lives with her grandfather and spends her time roaming the forests with her oversized porcine pal: the eponymous Okja. All is rather perfect and harmless, until, of course, the bigwigs over at the Mirando Corporation check their watches and decide that Mija’s time is up with her best and only friend. They send Dr. Johnny (Jake Gyllenhaal), the devilishly loony face of the company, to essentially reclaim their property (and to quite literally bring home the bacon). However, upon their timely intervention to recapture Okja, the resourceful and steadfast Mija enlists the aid of the Animal Liberation Front, an ideologically righteous protest group hell-bent on making anti-corporate statements that reach far and wide. Bong takes the time to give each member their moment in the spotlight, knowingly deploying the abundance of charisma that includes Steven Yeun, Lily Collins, Daniel Henshall, Devon Bostick, and the deceptively solemn Paul Dano. The adventure that follows frequently walks a tightrope between absurdist humour, anti-capitalist satire, and vegetarian propaganda - with all the controversy and collateral damage that such cinematic escapades often incur. There are as many touching moments of innocence and wonder between Mija and her otherworldly pet that recall the likes of E.T. (1982), Pete’s Dragon (2016), or the works of Studio Ghibli, as there are torturously unwatchable scenes that document the animal cruelty prevalent in the meat industry. Bong’s penchant for shifting tone and manipulating genre are on full display in Okja, cementing his status as one of the world’s most talented and diversely capable filmmakers. His ability to interweave gorgeously choreographed high-octane spectacle, emotionally wrenching, narratively satisfying character moments, and scathing political commentary under the guise of outrageously unhinged performances demonstrates no end of skill or wit. If Netflix gives him a platform to continue making films with artistic freedom and budgetary flexibility, Bong’s newfound creative avenue should come as a blessing rather than a curse in an age where directors walk away from Ant-Man and Han Solo movies over ‘creative differences’, where giving a $150 million superhero production to a woman is ‘a gamble’, and where Harvey Weinstein considers films like Snowpiercer ‘not for a wide audience’. This review was published on July 18, 2017.